he Parker "75" was designed by Kenneth Parker (son of the founder George Parker) and the designer extraordinaire, Don Doman (who also designed the Parker "45", Parker "61", Parker "T1", Parker "VP" and Liquid lead). After the great success with the Parker "51" came an era of decline for the fountain pen, the ballpoints sold in greater and greater numbers. Parker was eventually introducing the Jotter ballpen which sold very well, one reason being that it fitted as a set to the Parker "51" which was just about in everybodys pocket anyway. Parker tried (as they had before) to capture the broad markets with cheaper pens: Parker "21", Parker "41" and the Parker "45" (introduced in 1960, that was to become Parkers greatest seller in the low-priced area). But Kenneth Parker was not satisfied. The Parker company was always reluctant to appear as anything but a high-classed company that made high-classed pens, and since the Parker "61" never became the ultra-seller Parker had hoped, KP (so called by his employees) wanted to introduce yet another top-line fountain pen. Another reason was that even if the Parker "45" and the Jotter sold very well, they also sold for very little money, leaving Parker with a small margin. Kenneth Parker characterized the company as being "in the early stages of rigor mortis unless something is done to recapture the higher-priced, gift-oriented business". Kenneth Parker wanted the new pen to be aesthetic, innovative, expensive and a good writer. e borrowed the idea of an adjustable nib from himself, from the, at the time, not very popular Parker "VP", Very Personal, which he and Don Doman also designed in the early 1960's, (it was launched in 1962). The conformed grip allowed the user to adjust the nib to his hand "...like one adjusts the lens of a fine camera...", as Kenneth Parker used to say. He borrowed the filling system (cartridge or converter) from the Parker "45". He borrowed the grid pattern from his cigarette case, made by a London silversmith. To make the pen in solid gold would have been too expensive so Parker decided on sterling (a very pure) silver. During manufacturing the pens were made in smooth silver into which was later cut lines and a type of stain was added in the cracks to highlighten the rectangular plates. This made the grid-patterned silver pen only to grow more beautiful with time. The gold clip and trim together with the 14 carat gold nib wrapped up the design. When the new pen, called Sterling Cicelé hit the market in 1964 (the pen was finished in 1963, though, Parker's 75:th anniversary) it cost $25, which was extremely high for a pen aimed at the "broader" public. Again proving that if you have a quality product with an interesting design, people are willing to pay high prices for it. The new pen was destined to be produced for thirty years with only minor changes in the basic design. Some months later a gold-filled version was also offered called Insignia Cicelé. Photography ©2010 by and courtesy of Itzak "Tsachi" Mitsenmacher. 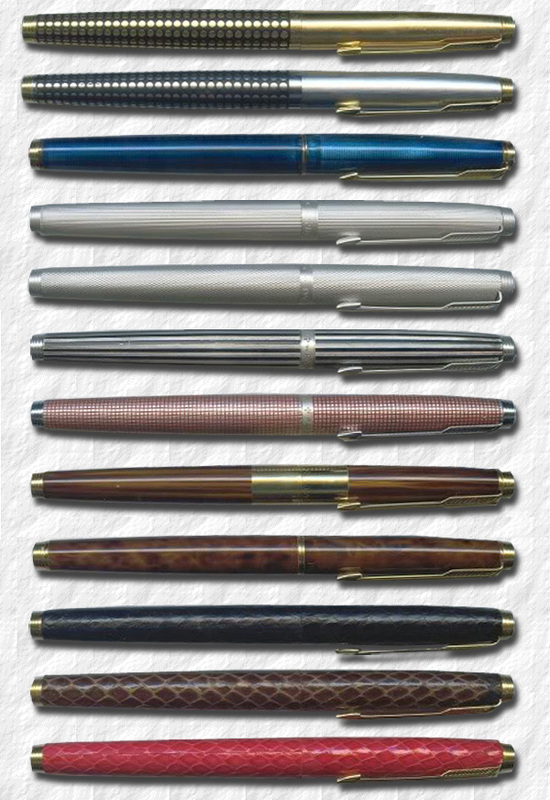 A fantastic collection of Parker "75" prototypes. A very attractive Vermeil, plain gold-filled Sterling Silver The silver under the gold giving it a special lustre. In the early 1960's a man named Fisher was tracing old Spanish treasure ships that had sunk outside the coast of Florida in 1715. Fisher managed to retrieve a lot of gold and silver ingots (bars) from the ships. Designer Don Doman conceived the idea to make a limited edition of the Parker 75 from this old silver. He discussed the matter with one of the Parker Companys vice presidents and was given the go-ahead. Fisher was contacted and quite a lot of the old silver was bought. The Spanish Treasure fleet 75 is today one of the most sought for Parker 75's, if not one of the most sought for (and in fact the first ever produced) limited edition pens. It only cost $75 back in 1966. Why didn't you buy a couple of dozen then? n 1967 Parker introduced the Keepsake. This pen was made in plain silver with broad "stripes" for "Habitual but well-intentioned forgetters of birthdays and anniversaries" with room to "Engrave this magnificent pen with a record of the important events in your life... all the occasions you want to remember. Anniversary — Family Birthdates — Special Honors — Membership in Fraternal Organizations". The idea might have been good but the pen never really got to the hearts of the public (although it followed the Cicelé pricing). A Presidential Keepsake in solid 14 ct gold was also offered at $100. The first Parker 75 was offered with a flat clip-screw, often referred to by collectors as the "flat-top" 75. In 1970 the clip screw was re-designed leaving a small hole in the clip-screw, this way Parker could offer to add an emblem or company logo to the top of the pen. The Parker Vector (RB-1) picked up this idea, only with a more elongated circle. The first Parker "75" models also had a grading scale engraved on the metal cover separating the nib/feed from the section and a wide, approximately. 4 mm space at the cap lip, like a cap band. In 1970 the section ring as well as the cap ring became narrower, app 1,5 mm. 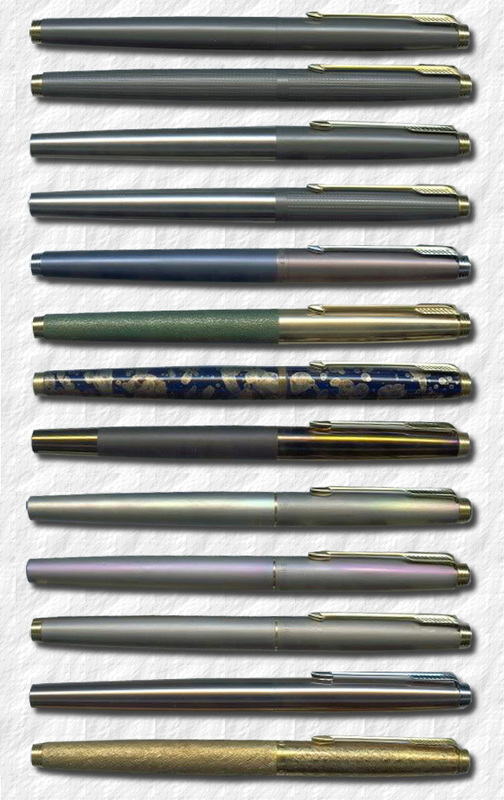 A marvelous collection of Parker "75" prototypes. lso in 1970 a new model, the Ambassador, was offered, this was about the same design as the Cicelé with the two differences that it was striped lenghtwise and had chrome trim. It was discontinued in 1980. Also in 1970 the Flighter DeLuxe was introduced. It was made in stainless steel with gold filled trim and the thin cap ring was made in gold. The Insignia Rainbow was another new addition with a two-tone cap. The Rainbow was made for two years only. he very first series had Chinese signs opposite the clip on the cap end but these was soon discontinued. The Vermeil and Lacquer collections were discontinued in the late 1980's. In 1991 the ink-collector became larger and the gripping section, previously with three sides, became rounded. The gold ring at the lip of the section (close to the nib) was prone to discolouration on accout of the acid in the ink and the ring was moved away from the nib, leaving a plastic ring between the nib and the gold. Other custom nib styles was also available for special order. he Parker 75 is an odd pen since it actually became more and more popular as the time went by. It managed to increase in sales during the "dark ballpoint years" of the 1970's and 1980's, like no other pen did. 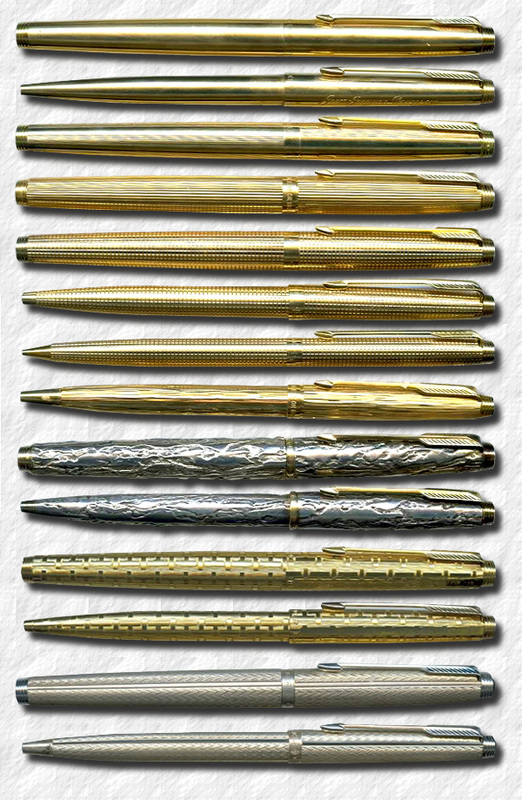 Between the years 1965 to 1981 Parker made and sold 11 million Parker 75's of different designs. It took the pen eight years to sell one million units per year, then sales was rather steady for about five years during the early 1970's, then again in 1980 it suddenly sold 2.2 million per year and it continued to be a good seller until it was discontinued in 1994 to make room for Parkers new top-line, the Sonnet.